Conax has developed exclusive, new technology that lowers the cost of ASM® EPSILON® reactor ownership. 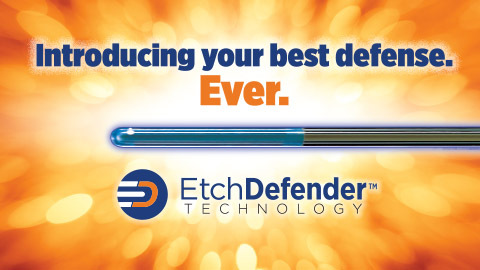 After eight years of development and testing, Conax introduces EtchDefender™ coating that protects quartz thermocouple (TC) sheaths during the epitaxial process in ASM® EPSILON® reactors—extending TC life up to 3 times longer. The epitaxial process takes place at one of the highest temperatures of any in the manufacturing of integrated circuits. Because the ASM® EPSILON® single-wafer epitaxial tool uniquely utilizes thermocouples that are installed inside the reactor chamber for process control, the thermocouples are exposed to two temperature cycles that can range from 600°C to 1200°C for each wafer processed. The second temperature cycle is the etch process, which is used to clean the chamber and all the internal components with hydrochloric acid at extremely high temperatures. As thermocouples are subjected to these cycles and corrosive hydrochloric acid etches, the quartz sheath is attacked and ultimately fails, requiring a maintenance cycle to replace them. EtchDefender™ coating is well adhered and will not flake from the quartz substrate, which causes particle contamination to the wafer. The coating does not decompose, out-gas or sublimate under vacuum at high temperature. EtchDefender™ greatly slows the devitrification process typical of quartz sheaths used in the EPSILON® by retarding the loss of oxygen from the SiO₂ quartz sheath at temperatures more than 900°C. The coating greatly retards the erosion process caused by hot corrosive gases flowing at high concentrations and velocities. This is most relevant in extending the life of the Center Thermocouple. To download our White Paper on our exclusive EtchDefender™ Technology or to view a brief video, click here.